The UC Santa Cruz Banana Slugs are the athletic teams that represent the University of California, Santa Cruz. The Banana Slugs compete in Division III of the NCAA as an independent member. There are fifteen varsity sports – men's and women's basketball, tennis, soccer, volleyball, swimming and diving, cross country, and women's golf. UCSC teams have been Division III nationally ranked in tennis, soccer, men's volleyball, and swimming. UCSC maintains a number of successful club sides. UCSC participates in men's and women's basketball, cross country, golf, soccer, swimming & diving, tennis, track & field, and volleyball. In the past, it has also participated in water polo. Starting in 2013, both men's and women's basketball teams play downtown at the Kaiser Permanente Arena. The Women’s Cross Country team has finished as high as 5th at the NCAA West Regional Championships in 2014 with 7th place finishes in 2008, 2015, and 2016. The best finish by the Men’s Cross Country team at Regionals was second in 2017, with 6th place finishes in 1985, 1989, and 2013 and 7th place finishes in 2014 and 2016. The Banana Slugs were runners-up in men's soccer NCAA Division III Men's Soccer Championships in 2004. By defeating Emory to win the 2007 NCAA Division III National Championship in men's tennis, UCSC won their sixth men's tennis team championships. They won their seventh championship in 2009 beating Amherst College in the finals. UCSC added a woman's track & field varsity program in 2012. In 2016, it added a men's varsity program as well. In 2017, the Slugs track & field team competed in all event groups, for both men and women, for the first time. In 2012, the Men's Volleyball Team made a Division III NCAA Semifinal's appearance. In 2013, the Men's Volleyball Team qualified for a second appearance to the Division III NCAA Tournament. UCSC is one of the largest but one of the least funded NCAA Division III members. The Women's volleyball team has made two appearances in the NCAA tournament-2013 and 2015. In the 2006 season, the men's water polo team won the Division III championship, as well as an overall NCAA ranking of 19th in the nation. However, both the men and women's water polo teams went to club status in 2008 due to budget constraints. In addition to its NCAA sports, UCSC maintains a number of successful club sides including its women's rugby NCAA Division team, which won the Division II National Collegiate Championship during its 2005 season and has competed at nationals several times since, most recently in 2010 and 2013. However, many other club teams exist such as soccer, lacrosse, baseball, rugby, softball, and muggle quidditch. The UC Santa Cruz Banana Slugs competed in the NCAA Tournament across 11 active sports (5 men's and 6 women's) 105 times at the Division III level. The Banana Slugs of UC Santa Cruz earned 7 NCAA team championships at the Division III level. Note: Those with no denoted division is assumed that the institution earned a national championship at the highest level. UC Santa Cruz had 18 Banana Slugs win NCAA individual championships at the Division III level. The Daily Slug, a publication that accompanied a November 1985 publicity stunt in which UC Santa Cruz students flew a 40-ft helium-filled banana slug into the Berkeley–Stanford football "Big Game" at Berkeley. UCSC's mascot is the banana slug (specifically, Ariolimax dolichophallus). In 1974 the UCSC club soccer team chose the mascot the "Banana Slugs". UCSC had no formal team sports at the time, therefore they had no mascot. Three team members, Larry DeGhetaldi, Fred Bicknell, Sven Steinmo and their roommate, Richard Hedges, chose to name the team the Banana Slugs before an All Cal tournament. They felt that UCSC should have a mascot too. The team's unusual name was noted by the San Jose Mercury News after the team suffered a humiliating defeat against the San Jose State Spartans. Several years later, when the club basketball team became more formalized (with a coach and expanded schedule), the athletic director at the time, Terry Warner, informed the team that they needed to have a mascot and that it had been chosen to be the Sea Lions. The team summarily rejected that name, claiming to not need any mascot. As such, their uniforms simply said "UCSC" on them. In 1981, when the university began more formally participating in NCAA intercollegiate sports, the then-chancellor and some student athletes declared the mascot to be the sea lions. Most students disliked the new mascot and offered an alternative mascot, the banana slug. In 1986, students voted via referendum to declare the banana slug the official mascot of UCSC – a vote the chancellor refused to honor, arguing that only athletes should choose the mascot. When a poll of athletes showed that they, too, wanted to be Slugs, the chancellor relented. The "Fiat Slug" logo prominently featured on campus is a trademark of UCSC owned by the Regents. It was developed by Bernt Wahl and two other students during the mascot controversy, who later incorporated as "Oxford West" and licensed their design from the Regents to produce clothing inspired by the university. The slug also is featured along with the school's logo on Vincent Vega's T-shirt in the 1994 film Pulp Fiction. By 2016 the athletic program had been operating at a deficit for many years, with its most recent expanding rising to $2 million per year even though its budget had remained at $1.4 million. Even so UCSC had the lowest operating budget in the NCAA Division III league. With few exceptions, most Banana Slugs teams had consistently very low attendance at their matches. At the same time the university was undergoing budget cuts that required a proportionate decrease in operating costs. Because of apparent lack of student support for college athletics, it was decided that it would be reasonable to channel the funds to other areas. UC Santa Cruz Provost Allison Galloway stated that under the current circumstances the university had to decide whether to keep funding the athletic program or to be able to maintain student services for an increasing student population. The administration saw that the only available option to maintain the athletic program was to significantly increase the student athletic funding tuition fee from $5 per quarter to $90 per quarter, which would total to $270 for the academic year. In comparison, UC Berkeley fee totaled to $110 per year, UC San Diego fee was $268, and UC Davis fee was $150. Both UC Berkeley and UC Davis were NCAA Division I programs and while UC San Diego was not D-I but D-II its spending budget was $9 million, more than 6 times UCSC's. UCSC's increase of the fee to $270 would only raise the budget to $2 million. An online poll was scheduled for the end of May, where students would be asked if they were willing to approve the increase. Due to opposition to the proposal by the university's athletes and coaches as well as alumni, it was considered to be very unlikely that such a significant increase would pass. On May 24th 2016, it was announced that a record 43% of undergraduates participated in the referendum with 63% approving the significant fee increase in concept. The measure did not actually create the new fee, however, but instead tested the support that students would have for a potential fee. The actual referendum to create the new fee waited a year, until 2017. In May, 2017, students approved Measure 68, the Intercollegiate Athletics and Athletics Activities Access Fee, a new fee of $38.50 per student per quarter. 39.23% of the student body cast votes, and 79.84% of votes were in favor of the new fee. The fee expires in Spring 2042. The measure is expected to provide athletics with $1.5 million per year. ^ "Quick Facts – UC Santa Cruz". Retrieved July 18, 2018. ^ "UCSC to play basketball games in Warriors arena". November 6, 2013. ^ "UCSC men's tennis team wins sixth national championship". Santa Cruz Sentinel. May 18, 2007. Retrieved February 8, 2008. ^ "A Brief History of UCSC Track & Field". College Running. 2017-05-30. Retrieved 2017-06-05. ^ "UCSC Men's Volleyball Semifinals of NCAA". April 28, 2012. Retrieved April 18, 2014. ^ Moses, Ryan (November 26, 2007). "Athletic director Linda Spradley spends her days keeping UCSC's teams afloat". Santa Cruz Sentinel. Retrieved February 6, 2008. ^ Moses, Ryan (June 6, 2008). "UCSC to cut men's and women's water polo teams". Santa Cruz Sentinel. Retrieved October 15, 2009. ^ "Women's rugby team wins Division II national championship". Currents. University of California, Santa Cruz. 10 (36). May 8, 2006. Retrieved January 29, 2008. ^ "Slug Run rekindles UCSC track tradition". Santa Cruz Sentinel. April 15, 2005. Retrieved February 8, 2008. ^ Conley, Mark (May 26, 2006). "UCSC students say yes to playing, no to watching". Santa Cruz Sentinel. Retrieved February 6, 2008. ^ "NCAA Championships Statistics". National Collegiate Athletic Association. Retrieved 23 May 2018. ^ a b "Championships Summary" (PDF). National Collegiate Athletic Association. Retrieved 20 May 2018. ^ a b c d e f g h i j k l m n o "Division III Men's Tennis Championships Record Book" (PDF). National Collegiate Athletic Association. Retrieved 20 May 2018. ^ a b "Division III Men's Swimming & Diving Championships Record Book" (PDF). National Collegiate Athletic Association. Retrieved 20 May 2018. ^ "Division III Women's Swimming & Diving Championships Record Book" (PDF). National Collegiate Athletic Association. Retrieved 20 May 2018. ^ "Leading in the New Millennium" (PDF). UCSC University Relations. p. 2. Archived from the original (PDF) on December 16, 2005. Retrieved October 25, 2017. 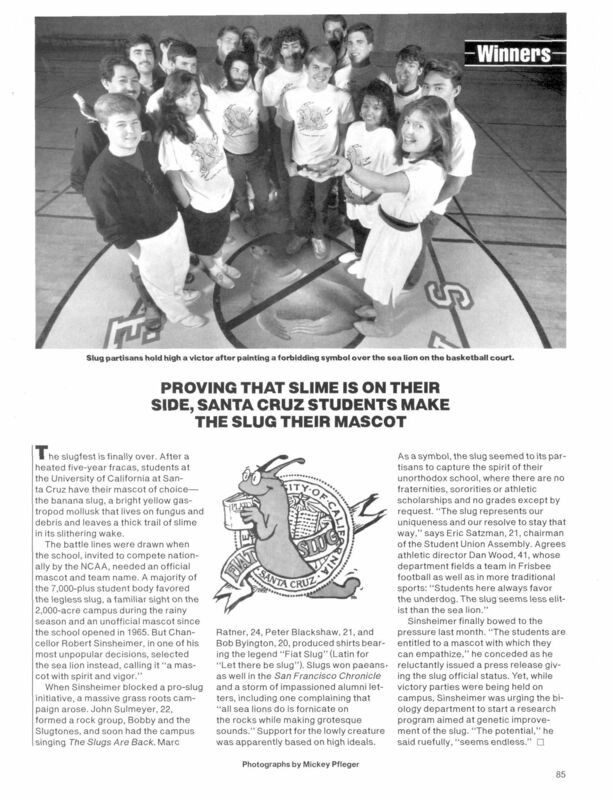 ^ "Proving that slime is on their side, Santa Cruz students make the slug their mascot" (PDF). June 16, 1986. Archived from the original (PDF) on August 29, 2011. ^ "Off To College: What Name's Got Game?". Archived from the original on September 14, 2008. Retrieved July 4, 2008. ^ The full pages spread on page 85 of People featuring UCSC's mascot choice. ^ "Banana Slug About Us". Oxford West. Retrieved February 29, 2008. ^ "UCSC General Catalog 2004–2006: Student Life (Banana Slug Mascot section)". Archived from the original on February 20, 2006. Retrieved May 4, 2006. ^ a b c d "Impending vote to cut UC Santa Cruz sports sparks outrage, sense of resignation". Archived from the original on 2016-07-17. Retrieved 2016-07-17. ^ "UC Santa Cruz chancellor calls for solutions to save NCAA sports". Archived from the original on 2016-07-17. Retrieved 2016-07-17. ^ "Athletics opinion poll wins student support". Archived from the original on 2016-05-25. Retrieved 2016-07-17. ^ "UC Santa Cruz athletics saved by Measure 68 passage". Santa Cruz Sentinel. May 31, 2017. Retrieved 2017-06-05. This page was last edited on 13 February 2019, at 15:41 (UTC).